→Baby Standing In Crib? How To Make Sure He’s Safe? Baby Standing In Crib? How To Make Sure He’s Safe? At one point or another, your baby will come across a newfound discovery (or milestone maybe). At around eight to ten months, he’ll begin to haul himself up and stand in his crib. 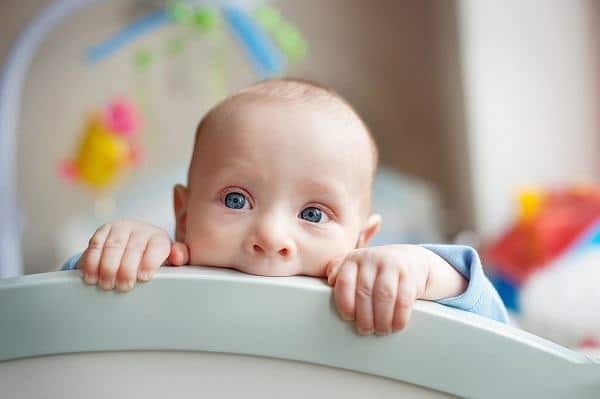 While this is a good sign that your little one's motor skills are developing properly, it's also a sign that you have to be more watchful of his movements. But when he does it at night when you're supposed to be asleep, uh-oh! So let me share how I was able to survive this change without losing too much sleep or sanity! But first, let me tell you why your baby's standing in the crib is something you have to prepare for. Just about when you had already trained your child to pull an all-nighter sleep, you'll soon find out that he starts to stand in his crib. That's basically good news, but not when no one is around. Especially, when it's night time when you're getting a bit of shut-eye. He'll be excited about his newly discovered skills, but what he doesn't know is that it's a challenge to sit down again. He will then cry and flop into the crib ﻿﻿sheet as soon as he is exhausted and he might fall and land on the crib side rails. Babies will become all too fascinated with this standing up in crib idea. He will forget his sleeping routine as soon as this happened. Then your child will get cranky due to the lack of adequate sleep. Parents are also not immune to this. Just about everyone around the house will lose sleep. Your hardwood crib will surely lose its varnish or paint. The time when babies start to stand in the crib is also the months when his second set of teeth appears. 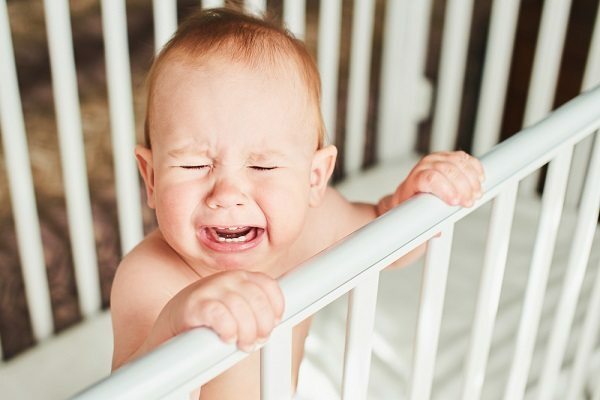 Since the baby is teething during this period, he will most likely vent his gum discomfort on the upper crib rails. Your baby might be a picky eater, but he will chew on his rails like candy. He will later rip off (and eat, yikes!) the varnish, wood pain or crib rail foam padding. Since this is the first time that your baby has mastered how to stand in the crib, parents will keep a watchful eye on baby at all hours. Rather than run the risk of your baby hitting his head, you’ll assist him to lie him down again and again. As soon as your baby hits the mattress, he’ll haul himself up again. Even parents with a monk’s patience will find this tiring. The cycle of cries and standing continues ad nauseaum. This back-breaking routine will test your wits. In my experience, if you lay him down again, he will be less and less persistent with standing up. Your playful baby might treat this as a game at first, so better put him down without eye contact. Also, you have to be consistent. It may tiring, but it should do the trick. Your baby will sleep longer and better at night if you are not pushing him to nap too much during daytime. Let him play and go standing in his crib at daytime. Do this and soon, the novelty will wear out. Your hyperactive 10-month-old might try to test your patience so outwit his senses. 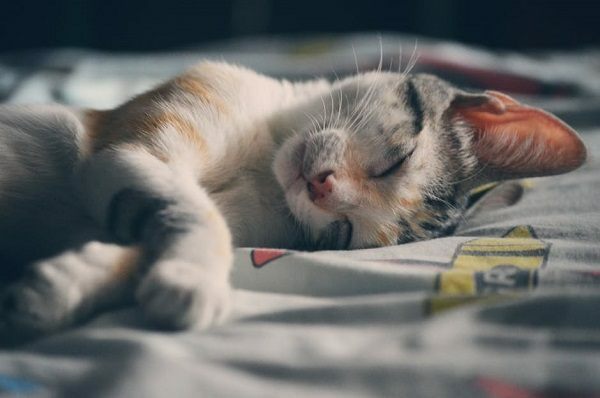 Create a “sleepy” bedroom by setting the right temperature and shutting off most lights. Using white noise that gives a soothing humming sound. Your child can also benefit from half swaddling; it works even for big and active babies. Deter your adventurous baby from standing up in the crib all night by installing crib nets on top. 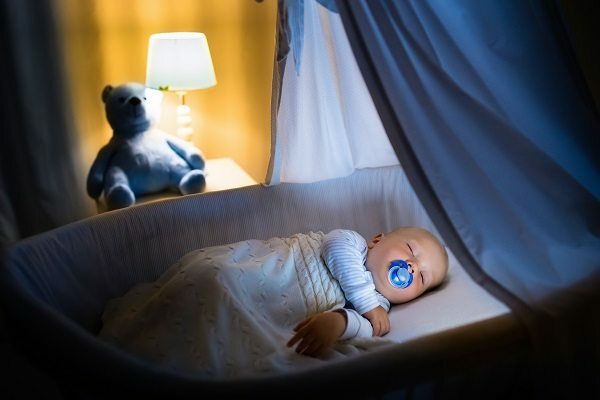 A small pack-and-play installed inside the crib will work just as fine. You may also use a sleeping bag at night to put him to sleep and to keep him in place. Babies who co-sleep and nurse at night tend to sleep longer. Co-sleeping will also remove the possibility of your baby consuming the whole crib rail all by himself, as he has your bed instead of his crib. You may also rock your baby on a glider before putting him back to sleep. 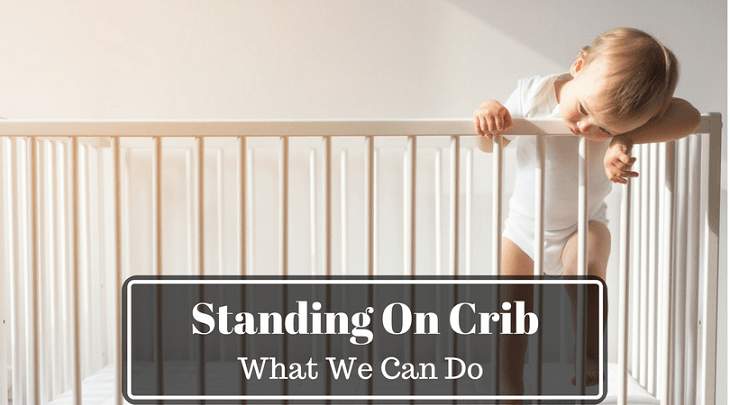 Yeah, it may take a lot of time before your baby finally decides to stop standing in the crib while you're asleep. It will be for the benefit of the both of you. Be consistent and patient with him. But most of all, seize every moment of it!